#29 "We've got our man!" In Dalton Trumbo’s 1939 WWI novel, Johnny Got His Gun, the main character has lost his arms, legs, eyes, nose, ears, tongue, both jaws and all of his face — but his mind still functioned perfectly. He is still who he is, he just doesn’t have his body anymore which suggests that our bodies are not essential to our self-consciousness or self awareness. Rene` Descartes philosophical principle, I think, therefore I am" could also be interpreted as,“ I think because I have a brain, therefore I am because I have a brain. Or, I am my brain, and my brain is me. If that is true then the notion that the brain can be detached from the body and transferred into a synthetic body without the loss of the self is more than just science fiction. In fact the idea of a human brain being transferred into a mechanical body is closer to reality than it might seem. Science has already made much headway in that direction. For example, humans are now fitted with artificial heart pacemaker and an assortment of artificial limbs. This combination of human and machine is called a Cyborg. A Cyborg is an organism that has both artificial and natural systems and is an idea that has been around in novels back before WWII. In 1908 a French novelist wrote a novel, The Man Who Can Live in Water, in which the superhero was a Cyborg. Also C. L. Moore’s 1944 short story, “No Woman Born” was about a dancer whose brain was placed into a mechanical body. There have been a number of other books written on the subject as well, including, the Book of Ob. The Book of OB is set in the future in another galaxy where the transfer of brains into mechanical bodies is common place. The entire planet of Zimmnel for example is populated by Cyborgs. They are not the same Cyborg terminators as portrayed in the film The Terminator. The Terminators were a group of aggressive, violent Cyborgs bent on destroying other planets and human life. The Zimmnellians, who call themselves, “electro-people”, are quite the opposite. Their large, peaceful planet is in a galaxy where humanoids and Cyborgs co-exist. The Zimmnel electro-people do not travel around the universe trying to destroy or conquer other planets; instead they try to bring peace and stability to the universe. In this story we journey to a small organic planet called OB where our main character, Kenom Ornam and his friend Enew are spending a few weeks as planet patrolmen in an obsolete war dome owned by humanoids from the planet Flexton. They must share the dome with the humanoid Flextons along with electro-people from planet Verton as well as fellow Zinmellians. To complicate matters they are not allowed to disclose that they are electro-people for fear it will frighten the humanoids and cause instability on the planet. This is cause for some deception, but for the most part it is a harmless charade where no one gets hurt. Kenom asks to be stationed in a remote area of the dome hoping he will be able to relax, think and observe the beauty of the primitive vegetation on this planet. But things get complicated as two religious factions within the dome begin to face off. Kenom is reluctantly put in a position of authority where he is forced to arbitrate to keep things from getting out of hand. Because Kenom is a non-aggressive Cyborg from a peaceful planet and by nature a peaceful non-violent person, he tries to find peaceful ways to solve problems. Moral lessons are learned on the planet Ob as he comingles with brains of various power levels, some with belief systems quite different than his own. Zimmnel is a large, non aggressive, peaceful planet near the center of Galaxy 5. It is a non-organic planet populated by descendents of the homo-sapiens that used to inhabit the organic based planet Playton. There are no longer any organic homo-sapiens on either Zimmnel or Playton, they are now both inhabited by Electro-people, people with organic brains and electro-mechanical bodies. When Playton was still inhabited by advanced homo-sapiens, around the year five million four hundred and ninety, they began experimenting with electro-body parts. The first body parts they invented were a mixture of organics and electronics and were rather crude by today’s standards. But it was still a very good beginning and for a time they worked quite well. The first fully functional all Electro-body, the PL300, was developed on Playton in the year five million five thousand thirty-six and the first Homo-Sapiens brain was successfully transferred into a PL300 five years later in five million five hundred forty-one. Research and development of Electro-bodies had also been going on in Walmatt, Zimmel, and several other advanced-brain planets in this part of the Galaxy. But they were never able to make a successful brain transfer because they were working with mostly synthetic organic body parts. These parts would not hold up under light speed space travel. It was the discovery Zeltex on Zimmel that allowed electro-body parts to be made strong enough to hold up under rigorous space travel conditions. Zimmel is now the main supplier of electro-bodies for the entire Galaxy. Most advanced planets use only the Z501 Zemmnel electro-body for their transfers. The Z501 looks and functions like an organic body in almost every way. It is essential because to function properly all connections must correspond to the original organic body. In spite of the development of the Nefron 703 on planet Tricksen, which overrides most of the organic body functions, the Z501 is still the most used brain container by far. There are still so many organic-based planets in this part of the Galaxy, with organic people inhabiting them, that the Z501 remains the electro-body of choice. 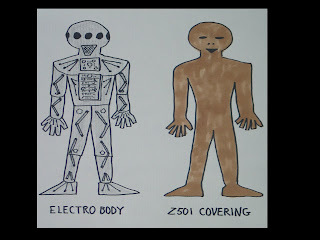 Electro-people still have to commingle with organic-body people in order to do business so the Z501 with its organic features like arms, legs, hands and fingers, will probably remain popular until sometime in the future when all planets evolve to the Electron-age. Another feature that makes the Z501 cost effective is the fact that it will keep an organic brain functioning, with good efficiency and low maintenance, for up to three hundred years. Organic bodies only last about half that long. The oldest known organic body lasted one hundred and fifty years. But it started to malfunction when it reached one hundred and twenty five years. Brains in organic bodies don’t function very well in the first place, there are too many disease prone body parts that distract the brain’s ability to think and concentrate properly. The Center for Electro-Body Research has been working on a new version of the Z501, the Z 800, which is suppose to last up to four hundred years but as yet they have nothing to show for twenty years of research and millions of Yebs spent. 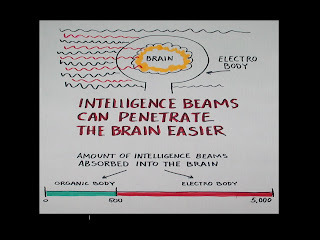 Originally the brain was transferred from its organic body into an electro-body after it had been allowed to develop in the organic body for about twenty years. Early scientists believed that it took that long for the brain to develop and mature properly. That is not the case anymore. Since the development of new DNA technology, organic brains are now grown in the laboratory and they have no need to be nurtured in an organic-body. Brains are grown in the lab and then transferred directly into an Electro-body. Gender also used to be an issue. At one time female brains were transferred into female-like electro-bodies and the males in male-like electro-bodies. But that practice didn’t last long. Scientists soon found that there was no difference in efficiency or power between male and female brains. Outside the scientific community however there is still some debate. Some feel that the male brain functions better in matters of war and other forms of aggressive posturing than does the female brain. There are those who believe that in spite of all the advances made in the area of body and brain technology, the brain still clings to its evolutionary past and that many of the Homo-sapiens traits still remain lodged deep in the DNA of the brain. For that reason, though gender is no longer a scientific issue, brain transfer records still show the gender of the DNA donor. One thing everyone agrees on. The brain becomes twice as intelligent in an electro-body as it ever could in an organic-body. In an electro-body more of the intelligence beams that travel with the Life Energizing Beams or LEB as it is referred to, are absorbed into the brain when it is not incased within a skull. It was this higher intelligence that allowed the LEB theory to develop. The LEB theory gave new credence to the Darwin evolution theory which had fallen out of favor after a revival in the middle homo-sapiens age. 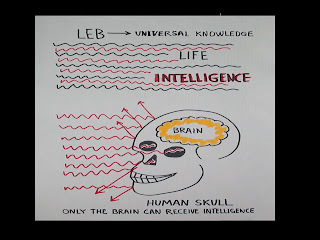 The LEB theory was developed not long after the first mass transfer of Homo-sapiens brains into Z501 electro-bodies. Once a certain level of intelligence was reached by the masses the old homo-sapiens God belief system, which violently opposed the Darwin theory, began to crumble. The belief that one’s body and soul was created in the image of an all knowing all seeing God was no longer credible. It falls short of reality when one knows that one’s electro-body was developed and engineered on the planet Zemmnil. It became common knowledge that God did not exist. One could tour the Electro-body factory on Zemmnil if one needed proof. For the Electro-people the religious homo-sapiens based theory of one God has been replaced with the LEB theory. 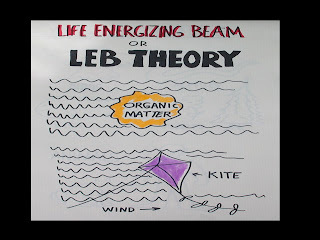 The LEB theory in essence is the theory that life is stimulated in all organic matter by certain life energizing beams that permeate the universe. These beams are similar to gravity, that is, they are only made manifest when they come in contact with organic matter. Therefore life is created and defined by these life energizing beams All that is needed to experience life is to have a brain, no body required. Because no one has yet to define just where these beams originate it has given rise once again to a God driven theory about life in the universe. There are currently two theories, - one is science based, one is religious based. The science based LEBers believe that science will one day provide an answer as to where these beams originate. The religious based LEBers, called Godforce Believers, believe that God is the source of these beams and no further investigation is necessary. 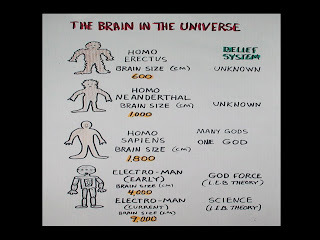 While that argument goes on within the electro-people community the traditional organic based belief system of a single God responsible for it all is still alive within the homo-sapiens community. God is not dead in this Galexy. There are still many organic based planets within light speed travel range of Zimmnil that are in the early phase of development. Some of these planets, such as Fignon, Ute and Flecton, have populations of homo-sapiens that still believe in the all knowing all seeing one God religious theory. And their ranks are still growing. The homo-Neanderthals in the Galaxy, who at the moment have no belief system at all, will one day evolve to the point of embracing this organic based belief system. It’s a natural organic progression. Its evolution. There are also those planets whose people are on the cusp, that is, they are advanced organic homo-sapiens with a brain size of almost 2500 centimeters. They are almost ready to become electro-people. It is these people that the Godforce LEB theory electro-people are working on. They want to convert them to their belief about the origin of the Life Energizing Beams before they become too enamored with the science that produced the electro-body. They send missionaries throughout the Galaxy in the hopes of converting these advanced homo-sapiens, soon to be electro-body people, into believing their Godforce theory. LEB science people tolerate the Godforce people and think of them more as a nuisance than a threat to science or the peace and stability of the Galaxy. Peace and stability is very important to the advancement of science and technology. So as a deterrent to anything that might threaten the peace and stability in the Galaxy, the Center for Galaxy Control built a series of “War Deterrent Domes” that they scattered here and there on small terrestrial satellite planets within reach of Zimmnil, small planets like OB and Lectroy. These planets are mostly small organic based planets, populated with primitive animal species like homo- erectus and homo-Neanderthals whose brain size seldom ever exceeds 1000 centimeters. The War Deterrent Domes were usually placed in remote areas high in the mountains of these planets. They have a low profile so they more or less blend in with the surroundings. Native organic lives on these planets seldom ever know that these Patrol Domes are there. Most War Deterrent Domes were built back in year-mark five million three thousand ten. That’s when the organic-based planet Fignon had a large population of homo-sapiens with a brain size of around 1800 cm. They had developed sufficient technology to travel in near space so they began plundering weaker neighboring planets for natural resources. This caused a lot of instability around the Galaxy. It wasn’t a constant year around problem however because the Fignons were superstitious and they decided it was only safe to venture out into space when the planets Zipton and Delfon and their three moons aligned with the planet Orkson. They called it “War Season” and it lasted about three months. But still, it was unsettling to the entire Galaxy when the Fignons were out doing their warring and pillaging. Zimmnil was far out of the reach of these primitive space travelers so the planet was not threatened. However, in order to keep peace and stability in the Galaxy, the Center for Galaxy Control made an war alliance with all the small organic-based planets that were within reach of the Fignons. They offered to build a number of War Deterrent Domes on or near their planets for protection. The deal was that the organic-based planets had to pay the cost of building these war domes plus provide sufficient funds and personal for all the maintenance and upkeep. The Zemmnils would supply the technology and a small contingent of about four hundred patrolmen to operate the blasters-guns and other sophisticated technical equipment in these war domes. So each year since that arrangement was reached, when War Season rolls around, a small contingent of about three-hundred and fifty or so Patrolmen are assigned to go to each of these small planet outposts to augment the fifty Patrolmen who are permanently stationed there. Its not a dangerous assignment because any fighting that’s left to do in the Galaxy is mostly done by regular army units. Planet Patrolmen are more like part of the diplomatic core in that they are mostly there to foster better relations between organics and electro-people. The Regular Army does all the real fighting and peace keeping from Mobil Space Platforms. The old war Domes are no longer capable of any serious Galaxy protection because the equipment is so old and obsolete. That’s why most of the old War Domes, like the War Dome on planet OB have been downgraded to Planet Patrol Stations. These War Domes serve no useful purpose anymore but it would cost more to dismantle them than it does to keep them going. They’re rather big and full of what is now known to be toxic material. It has been determined that this toxic material should not be disturbed so they can’t tear them down. And you can’t just walk away from these things anymore either, you have to clean up after yourself. Its Galaxy law. To the Zimmniltons the War Domes have become a waste of resources. They serve no useful purpose. But to the organic based planets that they are supposed to be protecting the War Domes are considered vital to their survival. Last year alone the War Consul on planet Flekton appropriated seventeen million Yebs for the Patrol Dome on OB. They tax the masses and tell them that it is for the continuing battle against the rogue Fignons. The masses on the planet don’t know that planet Fignon is no longer a threat and that the money is spent on space travel and high living for a few well connected Flextons. The governments on these organic based planets keep their homo-sapiens masses controlled by fear, and what is more fearful than the threat of an invasion. All the money they spend on these Patrol Domes goes to those with influence and connections. The Zimmnilelians tolerate this petty corruption because it is saving them the cost and trouble of dismantling these structures. They don’t say anything to the Flextons or the Playtons no matter what they do to these old obsolete war domes. For example, the War Dome on Lectroy has become more or less an entertainment compound. It’s lost any pretence of being a front line military post several years ago when Playton installed a bunch of advanced electronic gadgets, computer games, spas, gyms and things of that nature there. They also brought in enough alcohol to keep any sailor drunk for a millennium. The domes are full of middle class homo-sapiens from Playtons who love to party and carry on. As for the Zimmnil patrolmen, it attracts mostly the low LEB count Zimmnilian patrolmen who use it as a way to serve their military obligations without risking anything more than a bad hangover. The Patrol Dome on OB is a different matter. High-LEB count intellectual Flextons have taken over that dome. There are still some lowered middle class career warrior Flextons there too, but as they retire they are being replaced with more sensitive and peace loving Flextons. As for Zimminilian patrolmen it has become more of a duty station for the higher LEB count, well connected electro-men who are looking to advance some business opportunity or political career. One such a man was Kenom Ornan. His DNA father, Kebo Ornan, head of the Political Readjustment Dept. or PRD, on Zimmnil, and also Ambassador to the planet Zentow, has high political hopes for is son. Kenom had already served his required military time on Zimmnil. He spent five months as an intern working with his father at the PRD. But now that Kenom was intent on entering politics his DNA father insisted that he serve “real time” in the military as a Patrolman. To be a politician it is almost a requirement that one spend time in the military, “defending the great planet Zimmnil with one’s life”. Setting two months in an electronic cubical watching a computer screen was not considered “putting one’s life at risk.” It doesn’t matter that the only risk Kenom was taking by going to the Patrol Dome on OB was the risk of being bored to death. Hypocrisy is as resilient as a cockroach. Politics being politics Kenom was resigned to spending a few months on OB as a Planet Patrolman to please his father and advance his political career. In order to make the stay halfway tolerable Kenom talked his lifelong friend Enew into joining him. Enew had also already served his military obligation time but felt obligated to Kenom and his father. It was Kenom’s father who arranged for him to serve his time at the PDR with Kenom. They shared the same electro-cubicle. Enew was working at the Brain Transfer Unit in Kimor Provence, sector 18, unit 13. Before that he was a Loan Recall Agent at the Monetary Retraction Unit in the Department of Finance. He was used to boredom and being away on another planet for awhile seemed like a good deal to him. Besides, he knew that Kenom was going places and he didn’t want to be left behind. Enew would have preferred to go to the war dome on Planet Lectroy where all the fun games and electronic gadgets were but he knew it was out of the question since Kenom was going into politics. So he resigned himself to a bit of boredom in exchange for a chance at a front row seat in the high stakes game of politics. Besides he liked Kenom a lot and he knew that because of Kenom’s high LEB count it would make the trip interesting and maybe even fun. Before they were scheduled to disembark for OB, Kenon and Enew had to take a War Dome Orientation class to familiarize themselves with living in a war dome and get an idea of what was expected of a Dome Patrolman. They both signed up for a three day class called, Dome Patrolmen, Duties and Obligations and another four day class called, War Dome Orientation for Planet OB. They had to learn some of the basics of inter-species co-habitation. First of all in order for an Electro-man to commingle with Homo-sapiens the Z501 Electro-body has to be vulcanized with an organic-like material called Zemtex. Organics, especially those that have brain sizes under 1500 centimeters, are not ready to accept brains in Electro-bodies. They have a fear of mechanical looking beings. They become very hostile and would never voluntarily commingle with these “alien things” from outer space. That’s why all electro-people who travel to organic based planets, for business or patrol duty, must have their electro-bodies vulcanized with a covering that looks halfway organic. History shows the consequence of overlooking this little detail. When a research team from the electro-people planet Verton landed on the organic planet Cleenon with no covering on their electro-bodies, the Clenons, with a brain size of approximately 1,100 cm, promptly destroyed the entire expedition and ate their brains. The Verton expedition taught everyone in the electro-body community a valuable lesson about the unstable nature of brains in organic bodies, and the need to make the Z501 electro-body more organic looking. After the attack on their expedition the Vertons began working on an organic covering for their electro-bodies to make exploring on organic, homo-sapiens populated planets, more feasible. The first coverings were made from Velex which is an organic bi-product. These coverings didn’t pan out as the organic matter clung to the wiring and caused circuit damage. They solved the problem by using Fontex which is a more stable material made from ground up Polex. Zimmnil uses a material that their scientists developed called Zemtex . It is used almost exclusively for all their electro-body coverings because the raw material to make Zemtex is found in abundance on Zimmnil and that makes it the most cost effective material to use. The original coverings made by the Vertons were very elaborate. They actually made each covering have a distinctive look to match the organic beings on the planet they were planning to invade. That turned out to be too expensive as well as too much work. It took way too many hours to just to get into one of these outfits. Vertons found that all the time and money wasn’t worth the trouble. As long as electro-people looked organic and had arms, legs, eyes, and a mouth, - and brought gifts, they were pretty much accepted. Now days most homo-sapiens accept that all space travelers look more or less alike, so just a good practical organic-like covering does the trick. 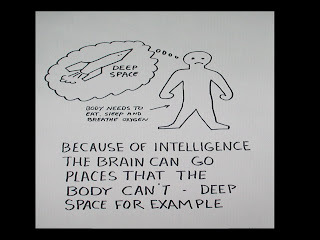 However, when the homo-sapiens brain size reaches around 1800 cm they begin to suspect something because, while they are limited to near space travel, it becomes obvious that those coming from deep space must have somehow overcome the organic body limitation, - but they are not certain just how it is done. Those in power that suspect a cover-up say nothing, it is a very guarded secret meant to keep harmony in the galaxy. You never know how the small brain size homo-sapiens masses are going to react if it were to be made public that it is suspected that electro-people are in their midst. In the War Dome Orientation class Enew and Kenom learned about the history and structure of a War Deterrent Dome compound. Up until then they knew very little about them. Because they are tucked away on these small organic based planets, light years away, most Zimmnilions have never heard of them. 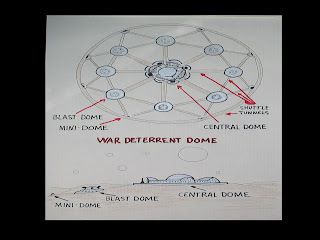 A war dome complex consists of a Central Dome, eight Patrol Domes and eight Mini-Domes. They are all connected by a series of underground tunnels. Inside the tunnels are small four passenger Dome Shuttles that run throughout the tunnels on steel tracks. The layout of the entire dome is like a wheel with the Central Dome being at the hub. The Patrol Domes which house the Neutron Blaster Guns, have connecting tunnels which make up the first ring of the wheel. The outer ring is made up of eight Mini-Domes connected by a long circular tunnel around the perimeter which has hundreds of small-arms firing ports. During “War Season,“ the Patrol Dome on OB is manned by, 400 Planet Patrolmen from Zimmnil, about 450 homo-sapiens, from nearby planet Flexkon , and a small contingent of around twenty Godforce believing Plutons, who are electro-men from planet Pluton. The Central Dome houses the large Neutron Blaster Generators that supply the power for the Neutron Blaster guns. It is also Planet Patrol command headquarters as well as the electronic control center for the entire compound. There are five floors in Central Dome. Floor one is the called the Flexton Gaming Floor. It is also the main tunnel shuttle transfer station. Flextons are allowed complete access to this floor. Floor two is called the Power Floor because it is the floor where you find the Neutron Generators. This floor is restricted. This floor is only for Electro-men. No Flextons are allowed. Floor three is the main computer room with hundreds of electro-cubicles. This is also where you find the Patrolmen electro-shut-down dormitories. There are a few Flextons allowed on this floor, mainly for cleaning and maintenance. Floor four is the administration floor where all the administrative work is done. A few Flextons are also allowed on this floor, again, for cleaning and maintenance. Floor five is the War Room or Command area. This floor has the Patrol commander and his staff. All decisions concerning the operation of the entire War Dome are made here. Only Zimmnilians are allowed on this floor, no exceptions. The eight Patrol Domes in the compound are three floor domes where the Neutron Blaster Guns are located. The Neutron Blasters are on the top floor and they’re manned by four Zimmnil Blaster Patrolmen. The top floor is off limits to everyone else, even regular patrol Zimmnilons. The main floor is occupied by the Flextons. There is one Flexmaster per dome. 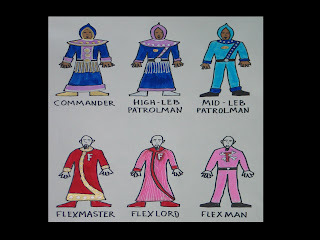 Each Flexmaster is in charge of his dome and is independent of the other seven domes. His entourage consists of twenty-four FlekLords and thirty or so Flexmen. The Flexlords are the privileged upper-class and have a high LEB count, and as they have no war duties, they come to the dome every war season to eat, drink, talk and have a good time. They always throw lavishly parties. No one objects since their planet is paying the bills. The Flexmen are the worker bees of the dome. They are mostly lower LEB men who do all the cooking, cleaning, and dome maintenance. On the perimeter there are eight Mini-domes. These domes were originally observation posts set up as an early warning system to alert Central Dome of an impending attack from near space or from a ground attack. These days they are not used because there is no threat. There is nothing to observe but the landscape of OB. These domes are seldom occupied because of their isolation. They can be occupied by anyone from Zimmnil providing they have permission from Galaxy Control Center and the Patrol Dome Commander. Mostly artists, writers and thinkers ask to use these mini-domes because it is quiet and the view is spectacular. There are at least six or seven painters and a maybe a writer or two on Ob every war season. They petition Galaxy Control and the Patrol Dome Commander for permission to use the mini-domes as studios. Those that apply are usually art traditionalists. These traditionalists are artists who still continue the tradition of creative observation, a tradition that has been outlawed by the Zimmnil established art community. If they get permission they hitch a ride with a patrol supply ship and spend almost the entire season sequestered in these small domes. The reason these artists come here is because Zimmnil is populated by electro-people with no discernable difference in appearance, and, as the planet is non-organic, with no natural landscape, so these artists come to OB to submerge themselves in the soul stirring beauty of nature. For even though the brain has grown in size and strength and has been transferred into electro-mechanical devices there still resides in the nooks and crannies of some minds a deep seated longing to connect with nature. For the most part however, artists on Zimmnil have purged or suppressed completely this “back to nature” urge and have looked to money and fame for brain soothing artistic satisfaction. All public and private buildings are now required to buy art. Art is even traded on the Galaxy Art Exchange. As a result art has become a big business on Zimmnil. Art schools have become business schools. Zimmnil artists are considered businessmen first and artists second. It is an accepted truism among young artists that the best businessman is the best artist. The Artist Business Bureau for the Advancement of Art has over a million members. They even have lobbyists at the Center for Galaxy Control to push for inter-Galaxy art standards. They insist that abstract, non-representational art be the “Official” Galaxy art and that it should be the only art traded on the Galaxy art exchange. It wasn’t always this way. There was a period when there was a flourishing artist community in the Galaxy. It was when the population of Playton was in its high Homo-sapiens stage of development with the average brain size of around 1,600 cm. Artists of that period wandered the planet completely committing their art souls to nature. Planet Playton being a beautiful organic-based planet encouraged and nurtured this “commune with nature” which was deemed so essential for the development of a true artist. Artists of this period produced some of the most profound and spirit moving landscape paintings in the Galaxy. Visitor from surrounding planets would make the journey to Playton just to view the works of these artists because they were held in such high esteem. For many years it was a duty to make a pilgrimage to Planet Playton to rejuvenate the soul. To meet and talk with an artist from Playton was a rare privilege. The artists on Playton lived in communes. Their living quarters were austere but adequate. They all shared in the everyday labor of growing food and infrastructure maintenance. They built large temples to display their work. These Art Temples is where many pilgrims came to view the art work. They were Temples for mediating and soul purification and rejuvenation. All were welcome. They were quiet, non assuming temples perfect for the contemplation of art. However, as the crowds grew so grew the potential for making money. It didn’t take long before unscrupulous money changers saw an opportunity. By manipulating the communication media and using other means which they excelled at, they were able to redefine the meaning of art. They convinced a naïve populous that art was too sophisticated for them to understand. They convinced people that art was very complicated and needed proper analyses before one could truly understand it,- proper analyses that only they and their artist collaborators could provide. It is not surprising that the masses became confused and no longer trusted their inner soul. With cleaver phrasing and high sounding words the money changers convinced the people that they alone had superior knowledge about what art was or wasn’t . It wasn’t long before they had control over artists and their art. Soon they began to sell what they now defined as art for big profits. Before long young artists no longer wondered the landscape their young minds were seduced by the prospects of fame and riches. The true artists were neglected, temples fell into ruin, pilgrims no longer came, and no one was interested in true art. The people were enticed by the money changers to frequent the new art viewing establishments, elaborate buildings with all sorts of tempting things to buy. Once they crossed the threshold and walked into these dens of the devil they were taken advantage of in the most egregious fashion. They were told by those within the building that what they were seeing was the best art that artists could produce. They were lead to believe that they were at the forefront of Playton culture when in fact they were being deceived in the name of profit and prestige. To do this, to take this kind advantage of people who want nothing more than to find solace and peace within their soul, to do this for the purpose of making money, to do this for profit is a very cruel and callus thing to do. It’s a crime against nature itself. By the time the brain transfers to electro-bodies were complete on Playton, the concept of artist as businessman had taken root and was the well entrenched. When a large portion of the population moved to the new non-organic planet of Zimmnil the business of art flourished. The idea of painting from nature never occurs to the painters on Zimmnil. That’s because nature as a subject never enters the artists mind, - its abstract or nothing. In spite of this there are still a few artists where nature’s DNA survives. It has managed to tuck away, deep in the wrinkles of the brain, a desire to connect. The descendants of those brains with those small bits of nature loving DNA are in the Zimmnilions artists who request permission to spend war season in the mini-domes. Interesting enough the first domes on OB were built by electro-people from the planet Vertron, They sent an expedition to OB looking for Ormealan a substance found on some organic-based planets that is used as a rocket propellant. They built a series of domes and underground tunnels for their mining operations. But there wasn’t much Ormealan on OB and when it ran out they dismantled their domes and moved their mining operation elsewhere. They left one small dome and a small contingent of low LEBers to do the cleanup work. They had planned to come back for them in about three years. However, in the mean time, Verton was invaded by the Cleenons and a forty year war ensued. Eventually the Cleenons were defeated. But not before the Vertons had lost their ability for interplanetary travel and communication. That left the Vreties on OB stranded. Before they could be rescued the Vertons had rebuild their planet infrastructure, which had been completely destroyed. Because they were unaware of the war that had taken place on their home planet, the Verties assumed they were to remain on OB for some strategic reason. They had no way to leave the planet and their communication equipment had long since stopped working, so they had no choice but to stay put and wait it out. They said nothing about their earlier mining operations when the Zimmnil advanced war dome exploration team arrived. They were afraid they might be giving away vital secrets. 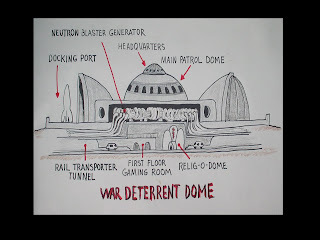 They did not object or complain about the war dome that the Zimmnilions wanted to build and even offered to work on the project in exchange for much needed electro-body parts and support equipment. The Zimmnilions just assumed that these Verties were a breakaway group of Electro-people looking for a simple life on a small organic planet so they decided to put them to work. They were used, because of their knowledge of tunnel building, to help build the War Dome connecting tunnels. After the dome was built they were kept on to maintain the underground rail shuttle system. However, they were not allowed to co-mingle with the other inhabitants of the dome. There was a fear that because they had been so isolated for so long they may not understand the need for the Patrol Dome protocol about co-mingling with Homo-sapiens. As the Flextons had the responsibility of ordering, storing, and distributing tunnel maintenance and shuttle supplies, the Zimmnil Patrol command had to be careful about how this was handled. So as a precaution, when the domes were completed the Verties were all vulcanized with Zimtex electro-body coverings before the first contingent of homo-sapiens from Flexton arrived. The Verties were also confined to their small maintenance dome and ordered to keep a low profile when working in the tunnels or on the shuttles. They were also given special uniforms with numbers on them so that they could be easily identified. They were in a sense treated like prisoners, but what could they do; they had no choice but to comply. 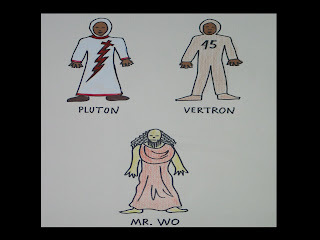 Another small group of Electro-people who were also closely watched were the God-force believers from planet Pluton. After the war dome was up and running, with a full contingent of patrolmen and Fleckies, The Center for Galexay Control allowed the Plutons to build a small Relig-O-Dome on the first floor of the Central Dome. The Plutons are missionaries hoping to convert the Galaxy’s organic bodied homo-sapiens, the Flextons in this case, to their God-force belief before their brains reach the 2,500 cm size, which is the size when the brain is ready for transfer into an electro-body. They need to get them to understand and accept the Life Energizing Beam theory and that their bodies are only holding them back from obtaining true knowledge of the universe. Once they accept that then it is just a matter of weaning them off the notion that God is an organic man with a beard in a white robe. Once they understand that God is the creator of the life force then they can accept the notion of electro-bodies much easier. Of course, with a brain size of 2,500 cm one is not easily fooled. The science and technology that goes into the electro-body process, and the deep space travel that it allows, tends to make the notion of an all seeing all knowing Supreme Being rather farfetched. With so much life in the universe, with all its diversity and uniqueness, to think that one species or another is special or chosen by some unknown, unseen God is to stretch common sense well beyond its limit. But the universe has always had zealots, and zealots will always be zealots no matter how unreasonable their cause. The Plutons are believers and as believers they feel it their duty and obligation to convert the God believing Homo-sapiens to their God-force belief before they are seduced by science and technology. To help with this they have a Universal Vision tele-view program that runs all day, all night, every day of the year. It broadcasts their God-force message constantly and can be picked up on Tele-view receivers throughout the dome complex. Most Flexies are bored with the program’s constant preaching so they seldom tune in. However, in spite of what some believe to be a boring simplistic message, the Pluton God-Force believers do have many followers in the Galaxy, including some followers on OB. They promote and support themselves through Universal Vision Tele-view programs and disc-recordings of popular sermons which they sell by the millions in domes across the Galaxy. As noted earlier, the Plutons and their God-force Relig-O-Domes are tolerated because they pose no real threat to the peace and stability of the Galaxy. Electro people have enough brain capacity to make rational judgments about the validity of the God-force theory on their own without the Center for Galaxy Control dictating what or what not to believe. However, when they set up their Relig-O-Domes in a War Dome complex they are required to adhere to the compounds rules and regulations and obey the dome commander. They are also required to wear distinctive robes to distinguish themselves from the general population of Zimmnilions. It is important that everyone in the dome know at a glance who is a God-force believer from Pluton and who is from Zimmnil. For the most part however, the Plutons stay within their dome and are content to do their preaching through the Tele-view broadcasts. The trip to OB takes about half a day. The first thing all duty patrolmen are required to do is report to the Patrol Orientation Master. Duty papers have to be filed, sponsor certification and Brain Size Identification must be made. Brain transfer papers also have be verified with the Central Galaxy Inclusion Department for authenticity. There have been a number of forged brain transfer papers found recently and the CGID is cracking down on this illegal activity. Brains from Xcepter homo-sapiens have turned up in Zimmnil electro-bodies more than once. Last war season alone fifty alien brains were found on OB. There is a thriving business of illegal brain transferring going on Planet Verton. The authorities there have tried to shut down these illegal transfer stations but they can’t find them all so the process continues. Because the economy on Xceptor is in such bad shape many high LEB count Xceptors with brains in the 1600 cc range don’t want to wait for the Galaxy Inclusion Department to certify their brain size, which is the first step in the long process that would eventually allow them to receive transfers into Electro-bodies. They figure these illegal transfer stations are the quickest way bypass all that bureaucracy. There is also a thriving business selling used or imitation Z501 electro-bodies. There is a risk of brain failure when these old or copied electro bodies are used, but not being able to find suitable work for your brain size can cause anyone to take risks. Once the transfer is made they are supplied with forged brain transfer papers and sent off to one of the many patrol domes. Once inside the patrol dome they sneak aboard a supply ship returning to Zimmnil. The Zimmnil Planet Protection Patrol tries to catch these planet jumpers but the Xcepters are always ten steps ahead of them. The Xceptors are a very resourceful lot. Once Kenom and Enew had been checked in they had to go to the Central LEB Center for a brain scan and LEB count evaluation. When a Zimmnil patrolman signs up for War Dome duty the brain has to be evaluated to determine what job is best suited for the brain power of the patrolman. Its done to match, “brain to duty.” One can have a high LEB count but still be less qualified to work on a Electro-beam controller that a patrolman with a lesser LEB count who has studied Electro-beam science at some brain enhancement center specializing in Electro-technology. For example the four Patrolmen assigned to the patrol dome Electro-Blasters are rated SEI, or, patrolmen who have Supreme Electro Interest, or, “Electroheads” as they are called back on Zimmnil. These patrolmen are classified, HE as in Hermit-Electros. It is determined that HE patrolmen have “co-mingling defects” because they do not conform to “normal patrol association“. Again, it’s part of the “brain to duty” matching system. Another reason new patrolmen must have their brain’s LEB count evaluated is so the proper uniform can be issued. Because all electro-people look alike uniform identification is the only way to separate and identify various brain powers. The lower LEB count patrolman must wear a full-bodied light blue uniform with red trim. The higher LEB count patrolman wears a long dark blue garment trimmed in purple with silver ornaments. They have an OB logo on the front. The Patrol Dome Commander wears a similar outfit trimmed in gold. The organic Flektons also have a wardrobe identification system. Their system however is not based on brain power; it is based on the traditional organic homo-sapiens system of political and financial power. The most powerful being the Fleckmasters who wear red robes with gold trim. In the second tier are the Flecklords who wear a pinkish robe with red pinstripes and dark red trim. The lowly Fleckmen wear one-piece pink jumpsuits. The Fleckmaster and the Flecklord’s outfits have patches with the letter “F” on the front while the Fleckmen have a center patch of two crossed wrenches with the letter “F” in the center. Two other uniforms found in the dome are worn by the Plutons and the Vertrons. The Pluton God-force believers wear white robes with a bright red crossed lightening strike symbol across the front. The red crossed lightening strike symbol is a blend of several ancient religious symbols found on various planets throughout the Galaxy, planets that have, or have had, a belief system which includes a firm belief in an all seeing, all knowing God. These uniforms are easy to spot from a distance making it easier for those who wish to avoid contact with these religious zealots to find a quick alternative route. The Vertons who have no power or prestige in the dome are forced to wear non-descript image coded clothing. Their one-piece garments are dark brown in color with no frills. That makes them a little more acceptable. It also makes them less noticeable because they blend in with the dark tunnels where they work. They have a gear patch logo and a large number on the front for easy identification in the event someone needs to report on an individual workers transgressions or lazy work habits. After all the paper work, brain scanning, and certifications were completed at the Patrol Orientation Master’s office, the two new patrolmen were directed to the Patrol Supply Area where they were issued their patrol uniforms. 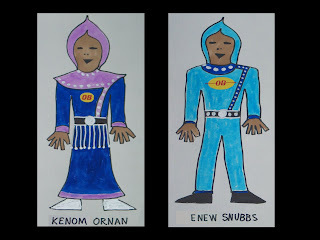 Kenom was issued a High LEB Patrolman’s robe because of his high LEB count while Enew received the standard Patrolman uniform. Once they were properly dressed they boarded a transfer shuttle and reported to the Dome-Duty Station for their duty assignment papers. When he originally signed up for patrol duty back on Zimmnil, Kenom had requested to be stationed in a Mini-dome. He felt the isolation would better suit his temperament. He wasn’t one for group speak or idle chatter. Because of his father’s connections, the proper documents had already been approved, sent, signed and certified and were waiting for him on the Duty Master’s desk. The Duty Master was a bit surprised at the request when he saw that Kenom was a high LEBer. It is rare that a high LEB patrolman would request duty in a small mini-dome where there is such little contact with patrolmen in the rest of the dome complex, especially the DNA son of an Ambassador. These Mini-domes are isolated and usually held for artists with A-LEB Peace ratings who prefer to be alone. However, Kenom, as previously stated, was just here to put in his patrol duty time for political reasons and had no desire to participate in regular patrolmen activities. He thought his time would be better spent, and probably more productive to him personally, if he fulfilled his duty obligations by reading and observing nature. They were assigned to Mini-dome “C” which is one of the eight mini-domes attached to the perimeter shuttle tunnel. Mini-dome “C” is also attached by tunnels to Patrol Dome 4 and Patrol-dome 5. To get from the Central dome to any of the Mini-domes one must take a supper-shuttle to one of the patrol-domes, and then transfer to small four man mini-shuttle which goes directly to the mini-dome. The duty master had one brought up beforehand and it was waiting for them outside the duty master’s office. Kenom thanked the duty master for his help, boarded the super-shuttle and sped off down the tunnel heading for patrol dome 4. On the shuttle trip to Patrol-dome #4 the shuttle was delayed for 30 minutes due to a small cave-in in the tunnel which had to be cleared before they could proceed. The Verton work crew was still working alongside the track when their shuttle was finally allowed to proceed. This was the first close up look at a Verton for Kenom. He had seen elector-images of them before but he had never seen one in person. Kenom was surprised to see them so dirty and disheveled looking and that many of them had malfunctioning Electro-body parts. He was rather alarmed to see these electro-people in such bad repair. He made a note to inquire about the status of the Vertrons when he met with the Patrol Commander two days hence. When they finally got to Patrol-dome 4 they made their transfer to a small four man mini-shuttle that would take them to Mini-dome “C“. While they were walking to the mini-shuttle they could hear what sounded like big party taking place on the main floor of the dome. The patrolmen were not surprised as the Flextons are well known for their extravagant parties; it appeared that they were right in the middle of one now. As they pulled out of the transfer station and the party sounds slowly faded away the hum of the shuttle turned their minds toward the peace and seclusion awaiting them just up ahead. Upon arriving at Dome “C” they secured the shuttle and entered the dome elevator that took them up into the dome. When the door opened they were both rather surprised at how large and well equipped the Mini-dome was. Aside from the usual electro charging room and electro shutdown room there was a large open area with a spectacular view of OB’s landscape as well as a grand view if the stars and planets. To the left, facing outward was a large telescope with numerous interplanetary viewing devices attached. Kenom particularly liked the large screen Image-viewing monitor. He was sure he would find the broadcast images in this part of the Galaxy highly entertaining. As they were going over the dome protocol and management manuals two Flextons arrived in a supply shuttle with the gear and equipment that they had sent from Zimmnil. Kenom was happy to see that his container of books was intact as he showed the workers where he wanted various containers placed. The two Flexton’s were startled to see that there was a “High-LEBer” in the dome. Even though their stares were concealed, and more or less confined to viewing reflections in the glass and mirrors, it was obvious they were excited and wanted to take in every detail. Flextons have all seen High LEBers before on the Image-viewers but almost never in person. This was a rare treat. They were used to the A-LEB artist types in this area not a High LEB count duty Patrolman. They couldn’t wait to be of some service so that they could tell their friends all about it. They had nothing against the A-LEB artist types that usually stay in these domes; they were nice people even if rather messy and uninterested in dome gossip and activities. But to be in the service of a High-LEB patrolman was going to be something very special. As Kenom and Enew began to unpack and settle in a voice transfer message came in from the Flekmaster over in Dome #4. It was an invitation to a welcoming party being held that evening in their honor. It seems that word had already gotten out that a High LEB Patrolman who was also son of an Ambassador was staying in Mini-Dome “C” and that it was an occasion for some networking. Dome politics was already beginning to show its nasty head. Kenom found out by reading the Protocol and Dome Management Manual that the Flekmaster in Patrol-dome 4 was named Tsubo Aseem. The manual said nothing more about him. He decided he had better run a brain size and LEB count check on him. Perhaps with a little more information he could better gage the meaning of such an quick invite. This would mean a trip to Central Dome where he would have access to the main computer system. So, as a stalling tactic, Kenom answered the invitation with a message saying that before they could attend any dome functions he and Enew first had to report to the Dome Commander and brief him on some important Zimmnil matters. He had a meeting scheduled with him in the morning. This might busy him for a few days, but after that he would inform him as to when they would be available for a social visit. Meanwhile Knew was testing the Universal-vision monitor to see if he could bring in some inter-planet broadcast that he had never seen before. However, he was having a bit of trouble. It seems that the only channel he could receive was the Pluton’s God-force channel, which he thought was rather strange. There must be thousands of broadcast channels in this part of the Galaxy, so it must be some problem with the antenna. Kenom suggested that he take it up with Flexmaster Tsubo when they met, as the Flextons are responsible for dome maintenance. While discussing the matter they were interrupted by another voice transfer message from dome 4. It was suggested that on their way to the Central dome to meet the Commander a brief informal meeting be held on the shuttle transfer platform. Just a quick introduction - nothing more. It seems that the whole dome by now knew of a High LEB Patrolman out in Mini-dome C and it was imperative that one be the first Flextmaster to greet him. Kenom felt he had no choice but to agree. It would not be prudent to offend a Flexmaster so soon upon arrival. So a time was set to meet the following day. Kenom and Enew shut down early that evening as their brains had been functioning for quite a long period of time. Kenom wanted to be fresh for his meeting with the Dome Commander. When they come on line again it was time to board the mini shuttle and head out for dome 4. Enew made one last check on the vision monitor to see if it was still stuck on the God-force channel. It was. He was upset and he was going to mention it to Flexmaster Tsubo. He was not pleased at how incompetent these homo-sapiens were when it came to doing anything other than socialize and party. As the mini-shuttle pulled into the transfer station they could see Flexmaster Tsubo attended by a small contingent Flexlords waiting on the platform. Kenom and Enew disembarked and walked up to meet him and his accompanying entourage. As introductions were being made a few Flextoids could be seen peeking from adjacent balconies and doorways, drawn by a natural curiosity to see the newly arrived Patrolmen. After the introductions were made and a few pleasantries exchanged the two patrolmen boarded the super-shuttle, saying that they would return soon for a longer visit. Enew added that there was a problem with the universal-vision monitor to which Flexmaster Tsubo replied he would dispatch a maintenance crew to look into the matter. And with a wave of the hand they were off down the tunnel headed for central dome headquarters where they would meet for the first time Patrol Commander, Major Sane Finloy, a good friend of Kenom‘s DNA father and sponsor of this Patrol Duty Assignment. They were no more than ten minutes down the track when they were stopped again because of tunnel repair work. This was unacceptable to anyone from Zimmnil who was used to highly efficient underground rail systems. Now more than ever Kenom was determined to bring this up with Commander Finloy. Not only was the tunnel and shuttle track in bad repair but the Vertons doing the repair were in need of repair themselves. Certainly if there was money for Flexton parties there was money for the tunnel upkeep and electro-body parts for the Vertons. It took almost twenty minutes before the shuttle was allowed to slowly advance through the damaged part of the track. It wasn’t hard to see that the two patrolmen were quite disappointed with what they had encountered in their two days on patrol duty. If this was how it was going to be one could imagine they had serious reservations about their decisions to volunteer for patrol duty on OB. Arriving at Central dome they took a lift directly to the fourth floor to Patrol headquarters where they informed the patrolman at the reception desk that they had an appointment to see Commander Finloy, The duty patrolman voice transferred the information to the Commander’ office and the reply was to send them right up. Kenom and Enew were both impressed with the efficiency of the headquarters staff. This was more like what one expected from Electro-people. In contrast it made the incompetence of the Flexton and their ability to oversee the Vertron tunnel repair crew stand out even more. One could only speculate on how incompetent the Flextoids themselves were at maintenance. A lift brought Kenom and Enew and an accompanying Patrolman to the fifth floor. They proceeded down a long circular hall until they came to a door which said, “Dome Headquarters. Commander Sane Finloy.“ Enew slid his identification card through the ID slot and the door opened. Inside were five High LEB patrolmen each with his own computer monitor sitting at a long desk. They continued working except for an occasional side glance, not at Kneom but at Enew. It is rare that a regular patrolman is allowed in dome headquarters, and never to visit the commander. Kneom approached the the desk and said, “We are here to see Commander Finloy.” “Business?” inquired one of them sternly. “He is expecting us” was Kneom’s curt reply. Just then a Patrol Major entered from the Commander’s office, “Hello, you must be Patrolman Kenom. Commander Finloy is expecting you, please, come this way.” Enew’s slight hand gesture could only be interpreted as a gesture of insult toward the High LEB patrolmen as he passed by the desk. With all the introductions done Knenom brought the Commander up on all the latest political news from Zimmnil. After that the Commander inquired as to which mini-dome they had been assigned, “Mini-dome C“, replied Kenom. “Good” said the commander, “you are attached to patrol dome 4 and 5. Flextmaster Tsubo Aseem in Patrol-dome 4 is an agreeable chap with a high LEB count. I will send over his brain analyses for you to read so you will know a little more about him.” Kneom thanked the commander and told him of their brief meeting on the way over to Central dome earlier. Major Finon reminded the commander of some pressing obligations so after a bit the meeting was terminated. As they were walking towards the door Commander Finloy asked if Knew would be so kind as to deliver some computer discs to FleckMaster Etel over at Partol Dome 5 on his way back to the Mini-dome. He also offered to have a patrolman give he and Enew a tour of Central dome if they were so inclined. They agreed to both propositions. As they left Enew reflected on the importance of having influential friends. As for Kenom, his thoughts were about the tunnel, he was a sorry that the opportunity never came up to ask the Commander about the Vertons and the tunnel repair situation,…perhaps another time. When they got back down to the fourth floor a patrolman was waiting for them. He introduced himself as Patrolman Flyn, one of the permanent duty patrolmen stationed here. He appeared to have a high LEB count but not high enough to be wearing a high-LEB uniform. He said he was to give them a tour of Central dome. “We’ll start with the observation platform on the fifth level” he said. As they proceeded to the fifth floor Kenom had a chance to take measure of the kind of Patrolmen that were stationed here year around. Patrolman Flyn seemed to be a strict, no nonsense type with little regard for anything non-electro. He made no effort to hide his contempt for the Flextons and their inferior brains still in organic bodies. Whether he was just being pro-electro to impress or that it was the prevailing sentiment here in Cenrtal dome Kenom could not discern. They emerged from the lift to find a large open area with a window view of the entire complex. 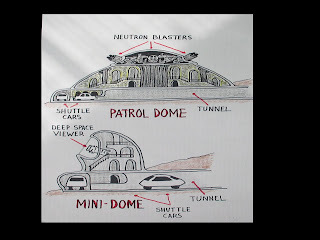 All eight patrol domes could be seen as well as some of the mini-domes and sections of the perimeter shuttle tunnel. It was quite impressive. Patrolman Flyn informed them that here is where they monitor the Nutron Electro-Blaster tests that they hold each month. These tests are not tests to gauge the efficiency of the blasters because as all Zimmnilions know they are practically useless for any real planet protection. Zimmnil has weapons with enough power to blast the entire planet of OB out of existence if it wanted to. The whole compound is just for show really. “The Flextons haven’t the slightest idea of how much blast power you need to be a factor in the outer Galaxy war zones,” offered Patrolman Flyn, “but as long as we put on a good show the Flexies are happy and the money keeps flowing in. As far as the patrolmen well they’re here mostly to learn how to monitor the equipment so that they can get good jobs when they return to Zimnel.” Kenom was impressed with the patrolman’s candor. After the observation deck tour they all three entered the lift and went on to view the remaining floors. Most of the upper floors were the same with rows and rows of fancy high-tech electronics. Nothing very exciting. When they arrived at level one, the Flextrons game and entertainment floor Patrolman Flyn lead them to a narrow observation room that went almost all the way around the perimeter. There were several dozen patrolmen more or less loitering around talking and wasting time. Watching low LEB organics play computer games was not a very engaging duty assignment. But once in a while something goes wrong and they are needed for Environment Stabilization. As they were finishing the tour of Centerl Dome, Kenom asked about the Relig-O-Domes. “Those domes were installed by the Plutons,” responded Patrolman Flyn, “we rent them space down here.” When asked how many God-force Plutons were in the dome compound the answer was a rather vague, “I‘m not sure, maybe 20.” The reason for that is for the most part the Plutons stick to themselves, just happy to be running their God-force channel on the Universal-vision. They come and go but seldom mingle with the patrolmen. They do have a few zealots on “Conversion Patrol” who work the upper floors looking to convert some Zimmnils. There is little hope of success however as the patrolmen in this dome are pretty much science driven. With the tour over, and thank yous given, the two patrolmen boarded a module and set out for Patrol-dome 5. The tunnel to Dome 5 was a little better than the Dome 4 tunnel but not by much. It was bumpy and noisy. They had to slow the module down several times in order to keep it steady. There were no Vertons working anywhere along the line but Kenom could see equipment laying here and there all along the track.. He was more determined than ever to mention this situation to the commander next time they met even if he had to interrupt. As they pulled up to Dome 5 they could see a small contingent of Flexlords waiting on the transfer platform. Apparently news of a High LEB ambassador’s son patrolman living in Mini-dome C had spread throughout the Patrol-domes. Among those waiting on the platform was Flexmaster Etel, master of this dome. He greeted them warmly as they disembarked from the module. Kenom handed over the parcel that the Commander had given him as he exchanged pleasantries. Flexmaster Etel offered a tour of the dome, especially to see their new Inter-planetary film viewing theater. He said it is quite popular with the high LEB organics. But Kenom begged off as they had just finished a tour of Central Dome and were ready to go back to their mini-dome for some quiet time. Perhaps another time he said as they walked to the module, we‘ll be here for the entire war season, then with a wave they sped off. When they arrived at the Mini-dome they found several messages waiting for them on the Vision-Monitor. One was from Flexmaster Tsubo who offered an invitation to visit his art gallery which contained an extensive collection of inter-planetary art. Apparently, because he was stationed in a Mini-dome, Flexmaster Tsubo assumed that Kneom was an artist. He was not. As a matter of fact he knew very little about art spending all his life in the diplomatic core. He had seen a lot of art but only as a spectator, not as a connoisseur. He agreed to meet the next day. The second message was from the Commander asking about their accommodations, if they were satisfactory. He also invited them to join himself and some of his friends for the Grand Sporting event held by the Organics in Patrol dome #8, a Patrol-dome that had been turned into a sports dome for the low LEBers in the compound. Kenom replied in the affirmative as he thought this might be a good time to bring up the Vertons and the tunnel repair situation. The third message was from Flexmaster Flyn who wanted to tell them about a new film visual they had just received from planet Ute which was about an artist living there named Shalon Kent. They were screening it that very evening. Kenom declined the invitation saying they had duties to perform and various things to attend to but that maybe at a later date…. It would seem that the whole dome compound thought that they were artists. That didn’t seem to be too much of a problem except that they weren’t sure how they would react once they found out that they weren’t. They weren’t sure if it was an advantage or a disadvantage. But after talking it over for a while they both decided it was time to shut down and rejuvenate. Tomorrow they would put their minds to other matters and let the art thing play itself out. When they booted up the next day they began by unpacking their supplies and arranging the dome to their liking. As they were unpacking the container from the Galaxy Business Encouragement Center they came upon something from the Artist Business Bureau,- several small abstract paintings to give away as gifts. How appropriate they thought. They could give one as a gift to Flexmaster Tsubo when they went to visit his art gallery. After a few more hours of unpacking and arraigning they finally had time to set down and enjoy the view. The landscape of OB was spectacular. Primitive plants of all kinds, lush and vibrant, in a variety of colors. It was most pleasing to the brain. Several hours were spent doing nothing more that soaking in nature’s beauty. But eventually they had to get back to the business at hand. It was time to meet with Flexmaster Tsubo. Kenom selected two small abstract paintings from the stack and joined Enew in the shuttle. Thus armed they set out for Patrol-dome 4 to pay a visit to Flaxmaster Tsubo’s art gallery. Another tunnel delay made them late. When they arrived they made their apologies and offered the reason. It was no surprise to Flexmaster Tsubo as he was well aware of the tunnel problem. He made his opinion known blaming it on,” those incompetent bureaucrats over at Central dome.” It was his opinion that since they never used the tunnels their upkeep and maintenance had a low priority. Knew offered that he would be going to the Sport event over at Patrol dome 8 on the morrow and would bring up the subject when he met with the Commander. Flexmaster Tsubo smiled and thought to himself that perhaps having this High LEB patrolman as a friend might eventually pay some nice dividends. They proceeded to the art gallery. It was a large room, well appointed but not overly done. There were hundreds of paintings hung on the walls of various subjects, mostly portraits and landscapes. It was nothing either Kenom or Enew had ever seen. They were used to seeing only the art on Zimmnil which was subject-less abstract painting. They had never seen such a variety. Flexmaster Tsubo had collected these paintings from various painters on planets within the Flexton’s limited space travel reach. Flexmaster Tsubo was particularly fond of his paintings from the planet Ute. He said that Ute was a small art-based planet with no resource value that had a tradition of art that went back thousands of years. Because the planet had no resource value it never became a warring planet,. The Ute’s never had an army and were never attacked or invaded. They remained peaceful and never succumbed to fear, even though planets all around them were always bickering and fighting with each other, The Utes are loved for their art and their friendliness. After every war season Tsubo said he goes there for several months to reset his thinking. As they talked about various paintings and painters the two Patrolmen began to truly enjoy hearing the opinion of this 1,600 cubic centimeter brain. It was clear that art meant more to these organics than it did to the electro-people on Zimmnil. To a Zimmnilian art was just color and design, it was more of a business than a creative pursuit. These paintings were actually about something or someone, -and it certainly wasn’t a business. How quaint thought the patrolmen. As much as Kenom enjoyed looking at the paintings and talking to his host he couldn’t help but think that this poor man would eventually find out that art was a business and that no matter how noble the painters were on Ute, when some resource of value was discovered there and the Electro-businessmen descended upon them, they would, like everyone else, succumb to the temptation of money. And when that happened this peaceful planet with its peaceful people would become entangled in war, politics, greed and corruption just like all the rest of the planets in the Galaxy. He had seen it happen again and again. The Flextons with only their near space travel limitations knew very little about the planets beyond. They had no idea what it takes to survive in an Electro world with deep space travel capabilities and electronic sophistication beyond anything their small brains could conceive. It was sad in a way. Here was this good man thinking that art somehow reflected the most noble of human activities, when in fact it reflected a naiveté about the real world outside the reach of his brain power. Still, Kenom was pleased that such a large collection of these early homo-sapiens naïve artists’ paintings existed. These paintings might someday be exhibited back on Zimmnil to serve as a reminder to future generations of Electro-people as to what was considered to be worthy subjects for artists, back before the business of art took hold. Other than that he could see no practical use or reason to keep them. Kenom’s thoughts turned to the two small abstract paintings he had brought to give as gifts. Perhaps if this art patron pondered their meaning he would see the future of art within them. If he did it would go a long way toward convincing the Center For Brain Inclusion Department that the Flextons were close to being ready for brain transferring which would then allow them to participate in the activities of the greater Galaxy. When the visit was over and the two patrolmen were ready to board their mini-shuttle Kenom retrieved the two small Abstract paintings he had brought along. He offered them to his host as a gift from the people of Zimmnil with the hopes that their two planets would someday share the same cultural goals. Flexmaster Tsubo was very pleased to receive such a most wonderful gift. He handed them to one of his attending Flexlords who marveled at the fine straight lines and bright color combinations. The other Flexlords gathered around the paintings and began talking among themselves. Their praise was enthusiastic and seemed sincere. It was most welcome to hear and both Kenom and Enew were bursting with pride. They felt that through art they had built a small bridge over the gap between Homo -sapiens and electro-men. Their superior brains had found a way, with these small paintings, to relate to the smaller brains in homo-sapiens. As their shuttle pulled into the tunnel with its happy cargo of two contented patrolmen, and the module disappeared down the tunnel the Flexlord holding the paintings turned to Flexmaster Tsubo and said, “What shall I do with these?” Tsubo smiled and gestured with his hand toward the floor. The Flexlords laughed. They understood, the two painting should go into their “Friendship Gallery” which was located in the basement of the dome. Every war season they get more of these atrocious daubs from Zimmnil and rather than throwing them into the space trash bins, as they would prefer to do, they decided to store them in a dark unused room in the basement. They don’t want to take a chance they could get found, they could pollute the entire dome. When they pulled into Dome C there were two Flexmen waiting for them on the platform. They could see by their uniforms that they were repairmen. "Hello," said one of them, "I understand you are having trouble with your Universal-vision. Fleckmaster Tsubo sent us down here to have a look at it." "Of course, please come in. I'm patrolman Kenom and this is my friend patrolman Enew." "Hello, I'm Zelton and this is my partner Zeno, we're from Dome #3. I saw you last night at the transfer station. I was doing some work on the electro-lighting." "Yes, we were there briefly. We were on our way to Central dome to meet with the Commander." said Kenom. "I’ve never seen the Commander myself,” said Zelton as they entered the dome, “We Flexmen aren’t allowed in that section of the dome…..so, what seems to be the problem with your Universal-vision?” "Well," said Enew, all we can get on the thing is the Pluton Godforce channel." 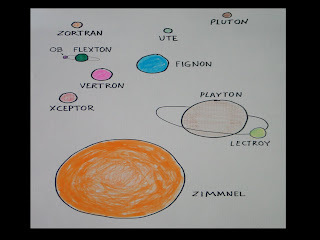 "Damn those Plutons" replied Zelton, "they are always doing stuff like that. They cross circuits in the back of the electro-panel, blocking out every channel but theirs. I'll bet that's the problem. Let's have a look." Zelton and Zeon took the back panel of the Universal-vision off and started checking out the circuits. "Sure enough," said Zelton, "these circuits have been tampered with. This Mini-dome hasn't been occupied for three month-marks, I'll bet they came in and crossed your circuits. Zeon will have to go over to dome #7 for a new panel. I have to call headquarters and report this. It will take a little while, do you mind if I call from here?" "No.,not at all," replied Kenom. Zelton came back into the room and started to remove the back panel. Kenom asked, "Did you make your call alright?" "Yea," replied Zelton, "I filed a report, but they ain't gonna do anything about it...they never do. I think half of those Flecktoids up at headquarters are Godforce believers themselves. They don't care what those damn Plutons do. Those Pluton Godforce zealots are a real problem here on Ob. They have everybody screwed up. Things were going good until they got here." "Oh really," said Kenom, "are there many here?" "I don't know," answered Zelton, "I've never seen one myself. They stay pretty much to themselves in their Relog-O-Dome over in the Central Dome with your Zimtel friends. I've only seen them on Universal-vision; they're on the Universal-vision all the time." Kenom was curious about the thinking of a homo-sapien with a brain capacity of around 1400 centimeters. So he questioned him further. "Have you been stationed here long?" he asked. "I was born here, on Ob, over in Fleck-city." replied Zelton, "...lived here all my life. My family is all gone now; I'm the only one left. I've been in the Patrol for thirty year-marks. This is the only planet I know. I'm not much on space travel. The patrol wanted to send me back to Flickton for electro-robot training, but I wouldn't go. We have enough electro-robot maintenance men already. The pay is better, but hell, money isn't everything." "I hear you Zimtilleons travel all over the place,...ever been to Clortron?" "Yes I have," said Kenom. "How about Clohen, have you been to Clohen?" "Yes, I've been there too." "Man, you Zimtellions really get around. We had a visitor from Clorton here once," said Zelton, "he was weird, like those Gypsons. He didn't last long. He got in trouble with the Verties and they shipped him back to where he came from. Good riddance I say." Kenom was silent for a moment then said, "A moment ago you said the Plutons should all rot in hell. What exactly did you mean by that? Where is hell?" Zelton was taken aback by this question. "You don't know where hell is?" he replied. "Well I know it is part of your God based philosophy but I am curious as to where it is exactly." "It's down in the center of Flickton," replied Zelton,"it's full of fire and brimstone." "Really,…what is brimstone?" asked Kenom. "Well.... I don't know exactly, but it ain't good stuff to be in, I can assure you of that." "I see," said Kenom, "so when you say that all Plutons should rot in hell, what you are saying is that you want all the Plutons to be back in the center of Flickton, in all this fire and brimstone stuff." "Well, something like that, I just want them to suffer a lot." "I see. And why should they suffer so much? Is it because of what you see on Universal-vision?" asked Kenom. "I never watch them on Universal-vision.... but I know they should suffer a lot, because ...because... well just because. I just don't like them." The Flextoid was starting to get a little animated, it was obvious he was still in the God based belief system and the competition from another religion was disrupting his thinking patterns. "All us Flecktons who believe in him will go to be with him in heaven when we die. It will be wonderful! And anybody who doesn’t believe will be in hell with all those Plutons!" "I see," said Kenom. "Where exactly is this heaven?" "It is out there in space, that's where... and it is a wonderful place too, full of all sorts of neat things, streets of gold and things like that.”Why would you need streets," asked Kenom, "are there modules there?" "Well,...I guess so,...sure, how else would you get around." "And who repairs the rails, the Vertons?" "Why are you asking me all these questions?....how should I know. Our preachers tell us that's how it is, and we believe them...the modules probably never break down, cause everything is perfect in heaven." "Please forgive me for asking you such foolish questions, I'm sure your priests are right about this, but, being from Zimtel, I am quite ignorant on these matters. Perhaps you could help enlighten me, please tell me more about your God." "Well, OK," said Zelton, "this is how it is. God, who created everything,- the entire universe, created Fleckton and made it special. Then he rested for a while, after that, seeing that Flecton was his best planet, he created Flecktons, in his image, to live there. He put life, that is, us Flecktons, on this good planet he created." "I see, so then God is a Fleckton, is that right?" interrupted Kenom. "No, no, said Zelton, we Flecktons just look like him, but he is much more perfect and powerful then we are. We are scum. We don't get to be like him till we die." "I see, said Kenom, "please go on." "Well, after he created us Flecktons, rather than us being good like we should have been, we just made a mess of things. We got all screwed up, you know, we got all corrupted and started being bad and were doing bad things to one another, kind of like what the Figgnons are doing to us, you know, fighting and stuff like that. God didn't like that one bit; he wanted us to be good. So what he did was he had himself a son born on Fleckton. He was called Eenon. His son was supposed to tell us Flecktons how bad we were being so we could change and be good like God wanted us to be." "Well that makes sense." replied Kenom. "Yea, but Eenon didn't live very long, cause those early Flecktons were really bad, they killed him off right away. Can you believe that? Here God has a son born on Fleckton, and the Flecktons go right out and kill him dead. It’s no wondering God hates us." "Does God hate you personally," asked Kenom. "Well, kind of....because, I am still a Fleckton, even if I was born here on Ob. My priest says all Flecktons are bad, unless they believe in God and try to be good. God hates anybody who is bad and doesn't believe in him, not just us Flecktons. Maybe not you Zimtellions, I don't know what he thinks about you guys, you all seem to be pretty good to me, but then I ain't God. Maybe you'all are doing something bad on Zinmmel." "That could very well be," said Kenom, "but please, continue; I find this all very interesting." "How do you know what is good and what is bad if Eenon was killed off so quickly?" "Oh, he wasn't killed off that fast. He lived for about thirty years." "I see, well then he had lots of time to write everything down for you, like what was good and what was bad." "No, not exactly, and that's the funny thing about it. He never wrote anything down, not one sentence. As a matter of fact he didn't tell anybody who he really was till they were ready to kill him." "You mean to say God had a son born on Fleckton in order to tell you how to be good, and his son didn't say anything until you were about to kill him? That does seem strange. How do you know then that he was really the son of your God?" "His friends said he was, and they wrote everything down after he was dead, that's how we know." "Oh, I see. It was God's son's friends then who told you what was good and what was bad, not God's son himself? Is that what you're saying?" asked Kenom, "It was the early Fleckmen who told you that Eenon was God's son and what you must do to be good. But how about the Cortons and the Clohens and the Plutons? I mean what you Fleckmen do might be good for you, but it doesn't seem like it would be necessarily good for the Plutons or the Clohens or the Cortons, am I right? Has anyone from Fleckton been to these planets to find out what they think is good or bad? or is there just one kind of good,-Fleckton good." "The only good is what God told us Fleckmen was good" "Has God ever told you personally what is good?" "Well not me personally, -he and his son just told some of the early people." "I see. Did he talk to them?" "Yea sure. He talked to a lot of the early people, and they wrote it all down,...lucky for us. It's all written down in God's book." "God's book?" asked Kenom. "As neither God nor his son wrote anything down, you must mean the book written by the early people." "Well, yea...but it's still God's book." "Have you read it?" "Yea, most of it." "What does it say?" "Well, I don't really understand a lot of it, but our priests do. They tell us what it says and what it means. They interpret God's book for us so we don't get it wrong." "Does God's book tell you what is wrong and right?" "Kind of, but we need the priests to tell us exactly what to do or not do to please God... and, of course if we please him we get to go to heaven when we die and live right there next to him, forever in eternity." "I see," said Kenom, "sort of like me sitting with the Commander over in Central dome." "Yea, kind of." "That will have to be a rather large table don't you think, if all two billion of you Flecktons are there, not to mention all the Cortons and Clohens. There will probably be some people from all the other planets in the universe there as well. It may be hard for you, personally, to actually get a chair next to him." “Well, God will work it out somehow," said Zelton, "our priests say he can do anything." "Hummm, I'm sure he will," said Kenom. "Please tell me more about this heaven. You say you will actually be their physically, do you mean you will look like you do right now, with the same body and everything?" "Sure. I will still be me, cept I'll be with God." "And how about your father and mother, will they be there too?" "Sure, even my grandmother and grandfather...and my brothers and sisters and uncles, aunts, cousins, everybody who has been good will be there, even my little brother who died when he was still a baby." "Will they look the same as they did here on Ob?" "Naturally, they will be just as they were here on Ob." "I see. Perhaps you can tell me then how your baby brother will look." "He will look the same, he will be a baby." "You mean he will have to spend eternity as a baby? That doesn't sound like much fun." "What?...well, hummm, I suppose he,.. well, I don't know how that works. I'll have to ask my priest." "And how about you? What if you don't die until you are very old and sick, is that how you will be in heaven?" "Oh no..... I'll have my healthy body back just like it was." "You mean just as it is now or just as it was when you were younger? Will you get to choose?" "I'll ask my priest." Just then Zeon arrived with the new Universal-vision part. "What took you so long?" asked Zelton. Not waiting for an answer he began to install the new electro-panel. After the panel was installed Zelton turned on the set and waited for an image to appear. It worked, but it was a little fuzzy. Zelton said he would have to go outside and adjust the antenna. When he left Zeon turned to Kenom and said, "Sorry it took so long, but they were working on the tunnel and I had to wait a while for them to fix it." "That's quite alright," replied Kenom, "I had a nice chat with Zelton." "Did he go into all his religious stuff with you? He drives me crazy with his preaching." "Well, as a matter of fact he did, but I didn't mind, his views are rather fun to listen to. I take it you are not a "God believer" like him." “Nope." replied Zeon, "and Zelton knows that too, I've made that clear. He leaves me alone. He's a native Ob'er, did he tell you that?" "Yes he did. Are you?" "Hell no, I was born on Fleckton and I'm going back just as soon as my tour of duty is up, in about three month-marks. This place is too corrupt for me." "Oh really, how's that?" asked Kenom. "Well, did you meet Flextmaster Tsubo and Flexmaster Flyn yet?” "Yes we did." answered Kenom, “as a matter of fact we just returned from Patrol dome #4 when we met you and Zelton on the platform. We had been visiting Flexmaster Tsubo’s art gallery - which I liked very much. I even presented him with two abstract paintings as gifts that I brought from Zimmnil to add to his collection. Zelton chuckled and rolled his eyes. I’m sure they were so very grateful that they were bowing and gesturing their respect and gratitude, right?" Kenom was a little taken aback though he tried to hide his surprise, “Go on," he said. "Well the fact is, ninety percent of them hate you Zimtellions. They can't stand you. They envy your technology, but they think you guys are a bunch of robots. They think there must be something wrong with your gene pool, cause you all look alike. Maybe not Tjubo, he's one of the best master up here, he's a pretty good guy. Most Zimmies like him. But as for his Fleclords they’re bunch of hypocrites. I’ll bet your paintings end up in their “Friendship gallery” which is a dark room in the basement. Myself, I have no problem with Zimtellions. I spend most of my time working in central-dome and the Zimmies that I deal with are pretty good guys. But those numb-heads up there in the patrol-domes, the ones who man thosee space guns, they are something else. They don't talk to anybody." "Well," said Kenom, "the Zimtellions who get assigned to the "space guns" are all very electronic minded and they seldom even talk to other Zimtellions. I can assure you that Zimtel patrolmen have no bad feelings toward any Flecktons. This is just a duty assignment and we all do our best to put in our time and go home." "Oh, I'm sorry, I didn't mean that we don't want you here, the Friggnons would be all over us if it weren't for you guys and your space guns. It's just that back on Fleckton we have a lot of problems, you know, like poverty and such, and when I see how much money these Fleck-masters and Fleck-lords spend on their elaborate parties and their fancy gold decorated domes, I get furious." "I am sorry to hear that, I am afraid I know very little about Fleckton." said Kenom. "No, no, I'm the one who should be sorry, I shouldn't have said anything." "That's quite alright," said Kenom, "it is good to be concerned about your planet and your people. It is very commendable." Just then Zelton returned. "OK, that should do it," he said as he adjusted the set. "You can get all the channels now." "Thank you, that looks fine," replied Kenom. "I can fix it so you can't get the Plutons Godforce channel if ya want said Zelton, two can play their game." "No, that won't be necessary, said Kenom, I might just want to see what they have to say." "Well, OK, but it ain't worth watching, I'll tell you right now. It's just a bunch of crap. Anyway, we've got to go. Let us know if you have any more trouble." "I will." replied Kenom, and thank you kindly for your help“. As they were leaving Zelton pulled a small pamphlet from his pocket and handed it to Kenom, "Here," he said, "this will tell you a little more about God and Eenon, you know, what they said." "Thank you," said Kenom, "I'll look it over." Zeon rolled his eyes as they turned and left.